Whether you're playing casually or stressing out in competitive mode, Overwatch's heroes tend to feel well-balanced. But there are always a couple of outliers that look to buck the trend. Here's our list of the five most powerful heroes in Overwatch. Starting off our list of best heroes in Overwatch is one that you would expect, Genji. A hero that everyone wants to play but are too terrified of the mistakes they’re sure to make, Genji fuses lethality and mobility into one tight robot ninja. When watching such streamers like Seagull play Genji, it’s incredible to witness what the robot ninja is capable of doing. 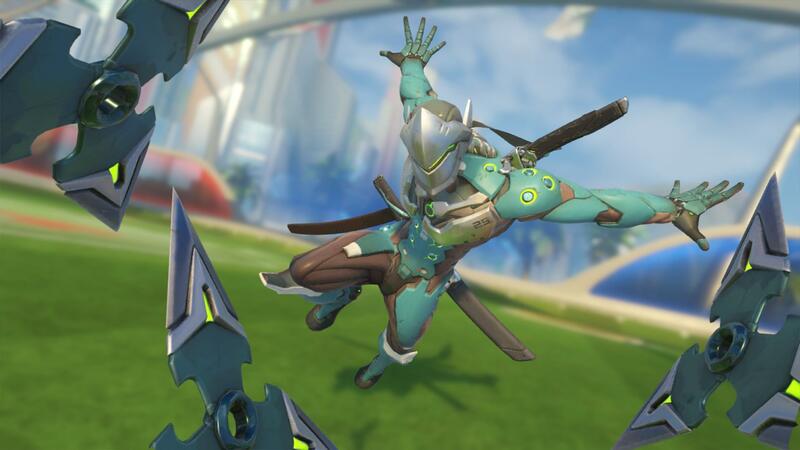 From running up walls, double-jumping, and redirecting damage, a well-played Genji has the ability to slice his way through an entire enemy team. Genji was one hero of Overwatch that we felt belongs on this list of powerful Overwatch characters regardless of whether he was easy to play. What makes Genji so great is his high skill cap, meaning that the more you progress through your Overwatch career, the better you’ll be with Genji. He’s a hero that rewards practice and skill. By utilizing his Deflect ability, you can effectively redirect an entire team’s worth of damage back on them. When used against an opponent’s Ultimate, like Pharah’s Barrage or a Soldier: 76’s Tactical Visor, a Genji can not only save his team from being wiped out but potentially wipe the opponent out as well, leading to a swift victory. His manoeuvrability and lethality make Genji one of those heroes in Overwatch that demands your attention and if left alone, creates a situation where you and your team are pulling your hair out, or pushing forward for the victory. Lucio continues to be one of the best support classes in Overwatch thanks to his mobility-increasing aura and damage mitigation through his Ultimate. Lucio has a surprisingly small hit-box (though not as outrageous at D.Va’s), and when you couple his stature with the speeds he’s able to generate, it creates a hero that can frustrate and disorient an enemy team. Lucio reminds us a lot of Sona from League of Legends in that his ability, Crossfade, allows him to switch between two music tracks. The first track gives off an aura of speed while the alternate gives an aura of health regeneration. The ability to increase your entire team’s speed is of high value, especially when playing Capture rounds on Ilios or Nepal, where reaching the center first can mean the difference between a loss and a win. 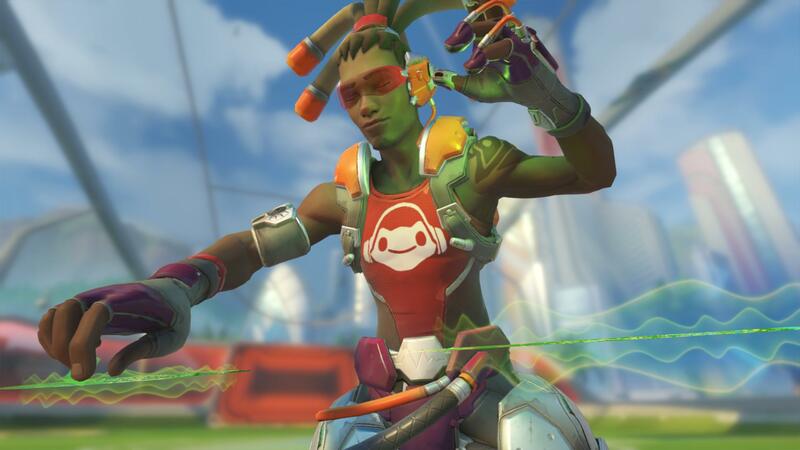 It also allows Lucio the ability to quickly remove himself, and his teammates, from enemy fire. Lucio’s Sonic Amplifier is his main weapon that shoots slow-moving projectiles. Hitting enemies with Sonic Amplifier can be tough to master, as the bullets aren’t hitscan.They have an actual travel time requiring you to lead your targets. The real boom behind Sonic Amplifier is its alternate fire mode that shoots out a Soundwave, pushing enemies away from you. Use this near an edge and watch as enemies fall to their death. If you find yourself looking at the hero list and struggling to pick something that fits your team, pick Lucio. You can’t go wrong with his abilities that are always active and always helping your team. A well-timed Ultimate can prevent enormous amounts of damage and his Soundwave will have you laughing as you push enemies off ledges. Lucio is definitely a pick worth considering. 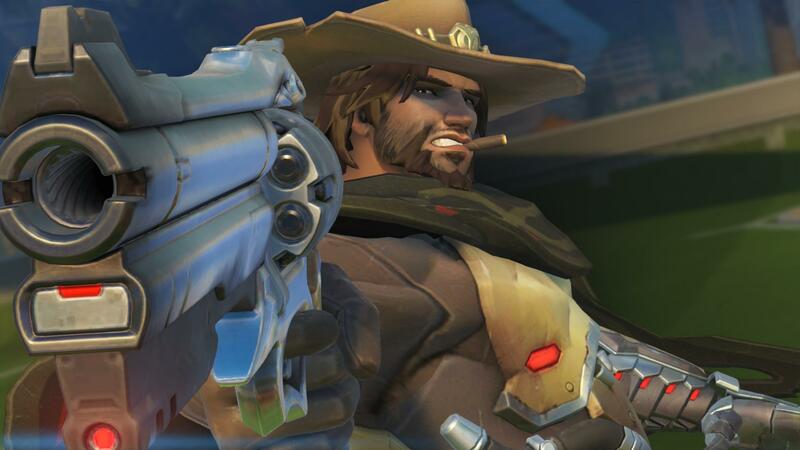 McCree’s position as a must-pick Offense hero has been solidified recently thanks to a few tweaks to his kit and as such, he has seen a rise in popularity. McCree’s attack range potential is one of the highest among non-sniper heroes in Overwatch. He boasts the ability to pick off enemies at a distance while also being capable of doling out staggering amounts of damage at close range. This is thanks to his weapon, the Peacemaker, which has two firing modes. The Peacemaker’s primary attack can be used to accurately hit enemies at a distance, while its secondary attack, Fan the Hammer, can be used for close-range burst damage. Fan the Hammer is ideal for eliminating targets that get too close to McCree. Despite recent nerfs to overall bullet damage, the Peacemaker can still chunk weaker targets for a lot of their health. Even tank heroes, who won’t die from one cycle of Fan the Hammer, can receive near-lethal amounts of damage. Add in McCree’s Combat Roll ability which immediately refills his ammo, and you will be able to string two cycles of Fan the Hammer together in quick succession. Using this moveset wisely and quickly will help you compete with even the most robust tanks. Despite the fact Combat Roll’s main use is to automatically refill the Peacemaker, it can be used as a means of escaping damage. Then you have McCree’s Flashbang, a device that stuns your opponent for 0.7 seconds. While the duration isn’t an entire second, it’s enough time for you to either perform a Combat Roll or completely stop someone’s Ultimate. McCree can be an extremely strong Offense hero when you string all his abilities together, and as such, earns a spot on our list of best and most powerful heroes in Overwatch. 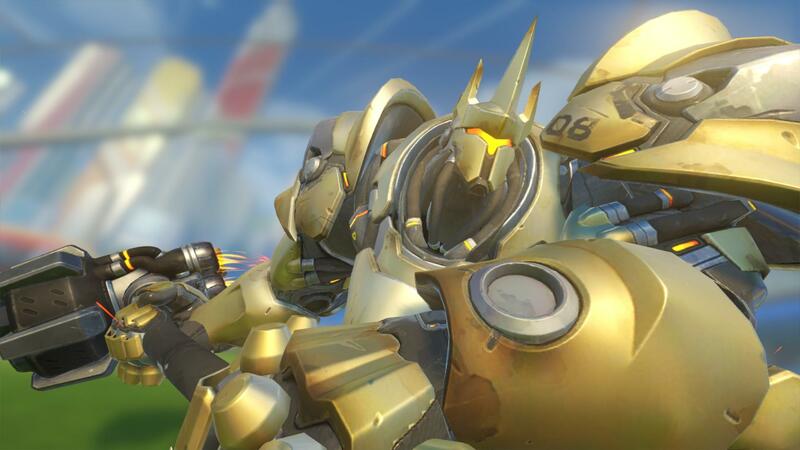 Reinhardt can be a monster to play against and a joy to use, especially when defending or attacking with a Payload. Part of Reinhardt’s power comes from his robust shield that offers a wide angle of defense and prevents enemy damage while allowing an ally’s bullets to pass through. The current meta of Overwatch dictates that picking Reinhardt is almost a requirement if you want to survive against some of the powerful heroes, most of whom are also mentioned on this list! Even though Roadhog beats out Reinhardt in the health department, having a shield with 2000 units of armor means you can survive more damage at a higher range for even longer. Even Reinhardt’s Ultimate can save more teammates than Roadhog’s. Reinhardt is able to use Earth Shatter to interrupt numerous enemies, stopping them mid-Ultimate and knocking them to the floor. Using this Ultimate leaves your opponents exposed for 2.5 seconds, and in a game like Overwatch, 2.5 seconds can feel like an eternity. For such a large unit, Reinhardt can move swiftly when using his Charge ability. Using Charge to quickly land on a capture point, followed by holding up your Barrier Field can pull an entire team’s attention toward you, allowing your allies to push in and secure a zone. Reinhardt is a hero in Overwatch that just seems to work, no matter the team build. Zenyatta has been rising through the ranks to become one of the most powerful and disruptive heroes of Overwatch. His primary attack deals out incredible damage, while his ying-yang Orbs either destroy an enemy or help an ally. This team utility comes before he even activates his Ultimate, which allows him to become invincible and continually heal large chunks of health for himself and his allies. The Orb of Discord is an ability that you need to deal with quickly. 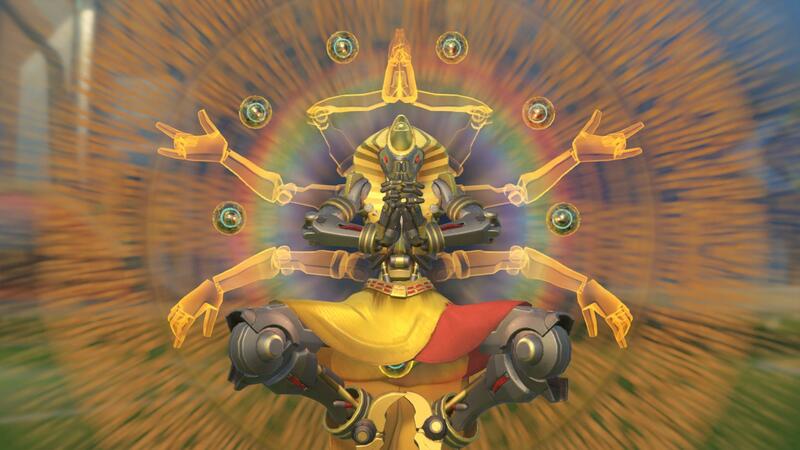 Get out of Zenyatta’s line-of-sight or prepare to have every form of damage against you increased by 50 percent. Staying in Zenyatta’s line-of-sight makes the Orb last until you die, and even removing yourself from combat leaves you open to increased damage for 3 seconds. When you play as Zenyatta, keep this in mind as you will want to chase down and harass any player that receives your Orb of Discord. For a support class, Zenyatta dishes out a lot of damage, but where the benefit of damage starts, his mobility ends. What is arguably Zenyatta’s greatest weakness is his inability to remove himself from combat with the swiftness that some of the other support classes boast. Keep in mind his low health and lack of escape whenever you choose to pursue enemies. Better yet, stay behind your tankier teammates and focus on whatever enemy they are laying into. Even though Zenyatta is one of the best heroes to use in Overwatch at the moment, it’s important to remember not to overextend yourself. What heroes do you think we’re missing from our list of most powerful heroes in Overwatch?